This golf games glossary at gamerisms is divided into 4 parts that includes an introduction and a learning games section for new golf players and fans. Golf games glossary is dedicated to passionate golf players and fans. The origin of golf is hotly debated as many different cultures had games that involved hitting balls with sticks toward goals. It is likely a combination of two or three of these games. Generally accepted is that the modern day game began development in the 12th century in Scotland. According to historical accounts, shepherds would knock rocks into holes with sticks where St. Andrews Golf Club resides today. Golf has turned into a multimillion dollar business as it is played today by millions of people around the world. Golf is a game played on an outdoor course with a series of 9 or 18 holes. The objective is to hit a small, hard ball with the use of various clubs into each hole with as few strokes as possible. Ace: putting the ball in the hole in one shot. Address: refers to the player's stance prior to taking a golf ball shot. Aggregate: term for partner's score. Airball: jargon for golf swing that misses the ball—a definite oops! Alignment: the positioning of the club and the alignment of your body. Amateur: a player who plays competitively, but not for money. Approach Shot: hitting the ball in the direction of the green, attempting to get as close as possible to the hole. Apron or Fringe: refers to the grassy section around the putting surface. Attack: to play the game with a gung-ho attitude. Automatic: lingo for easy score/putt. Away: refers to a player's ball that is the longest distance from the hole and therefore, will be shooting first. Back Door: jargon for a putt that takes a trip around the hole and plops in the back way. Back Lip: term for a bunker edge that is the longest distance from the hole. Bail Out: lingo for side stepping or escaping a trouble spot. Ball: weighing about 1.60 ounces and measuring 1.68 in. in diameter, a golf ball is made of rubber with outside pockmarks known as dimples. Ball in Play: occurs as soon as the ball is hit from the tee. Ball Marker: used to mark the spot of your ball while fellow player(s) play on. Ball Retriever: used to recover golf balls that have lost their way, this equipment is a pole with a net attached to it. Baseball Grip: gripping a golf club with the same technique used to grip a baseball bat with all ten fingers aligned evenly on the club handle. Beach: golf games glossary term for a sand hazard. Belt: refers to 'whacking' the ball with aggressive power. Bend: term for the action of hitting a slice or hook. Best Ball: a method of play in which any member of the team hits from the best shot. Birdie: putting the ball in the hole at one shot less than par. 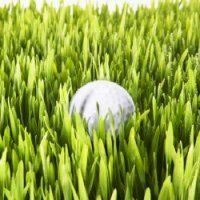 Bird's Nest: lingo for a deep grass lie of the ball. Birds: refers to a contest that awards point(s) for either an eagle or birdie. Bisque: term for a handicap stroke taken after the player announces his/her intent. Blade: lingo for the area of an iron used to hit the golf ball. Blast or Explosion Shot: taken from a sand trap, this shot brings along a bunch of sand with it. Blind Bogey: contest where a random score is drawn and the golfer who matches or comes closest is declared the winner. Blind Hole: golf games glossary reference to a hole on the putting green that cannot be viewed. Bogey: putting the ball in the hole one shot more than par. Bold: refers to an 'overshot' putt resulting from a hard hit. Borrow: lingo for a calculated putt to the side of the hole while considering the curve of the green. Boundary: refers to a 'pretend' line marking the play area of the course wherein a ball is considered out of bounds. Bowker: a shot that begins badly, but after deflecting off an object, places the player back in the game. A bad shot turns good. Break: the way the green is contoured that determines how the ball will roll. Bump and Run: the act of the ball bumping or landing on the ground at the end of a shot and rolling the rest of the way toward the intended target. Bunker: an area of play that is considered abnormal, typically a sand trap. Bunt: a short shot as planned by the player. Buzzard: golf games glossary term for 2 strokes over par for the hole. Bye: an easy move to the next round in a tournament and this player didn't have to take a swing. Bye Holes: refers to holes that need not be played as an early winner is declared. Now, here's a game that you can definitely attach the description passionate --Golf. At gamerisms, the defining games glossary for golf describes that passion and is presented in 4 parts.